Working at Pixar seems like a dream job for people in your line of work? How did you come to work there? Art was always encouraged in my family growing up; my Grandpa was an artist. My Dad worked as a carpenter but is also a very gifted artist. I too worked in carpentry, though I too had a God-given talent for art. Being homeschooled from K-12th grade, my Mom always gave me ample time to spend drawing and being creative. After homeschool I went on to get a Bachelor’s degree in Studio Art from Humboldt State University in our hometown in Northern CA, but the skills I gained at HSU were too broad to warrant a career as an artist, and I continued to make a living in building, remodeling and finish carpentry, supporting my wife and our first baby. My wife encouraged me to continue cultivating my abilities in art. It helped for me to identify that it was illustration in particular that I enjoyed so much, which means artwork that is both imaginative, but also believable, and able to bring a story to life. We decided to move to San Francisco where I got a Master’s Degree in Traditional Illustration from the Academy of Art University. My time at the Academy brought a huge increase in technical skill and an awareness of what types of companies hire illustrators (not many). Then, with a wife and two children, and a portfolio of artwork geared toward the animation industry (Pixar ideally), I started sending out applications. The year was 2009; the economy was hurting and I got no response to any of my job applications. We moved back to our hometown and I resumed work as a carpenter for a year, doing some art teaching at the local college and university, almost forgetting about one of the applications I had submitted to Pixar for their internship program. I admit I was concerned that with nothing but carpentry on my work resume, it may be hard to land a position in art. Finally, one April afternoon I got an exciting email from Pixar which led to a phone interview, and eventually, by God’s providence, I was given the one open Sketch Artist internship position for the summer of 2010, out of thousands of applicants. To my amazement, the man that chose me for the position said he particularly liked that I had a knowledge of carpentry, and could see that understanding in my portfolio. With our third child on the way, we moved to Emeryville for the internship. It went as well as it possibly could have; I worked on designing sets for Cars 2. However, a full time position didn’t open up until a year later. Now I’ve been working at Pixar for 7 years. Exactly what role do you play there? My current role at Pixar is “Designer.” In an animated film, unlike a live action film, everything that one sees on screen has to be designed. Everything from a small mouse crawling along the street to a full-sized city and everything in between. My focus is usually on sets, which means I design the environment of a film, i.e. all landscape, cityscape, background, props, etc. As set designers, we get to decide what the world looks like, and we draw plans for how to build it in the computer. We can use any medium for this task, from pencil on paper to digital painting on a monitor. What are some of the projects you’ve worked on at Pixar and which is your favorite? I worked on various Toy Story/Cars short films, Cars 2, The Good Dinosaur, Cars 3, Incredibles 2 (out this June), and currently I’m working a couple untitled original films. Getting into the nuances of car design while designing characters for Cars 3 was a highlight. If you could tell people to watch just one Pixar movie, which would it be? It would have to be Up. Very original and sincere. I was blessed to be raised in a Christian family, accepted what I knew of the gospel at an early age and was baptized as a teenager. But I lacked the fear of the Lord. It wasn’t until my late 20’s when, through trials, the Lord opened my eyes to my own sin and therefore a real understanding of salvation. Since then, by His grace, God has continued to prune me and grow my understanding of and affection for Christ. 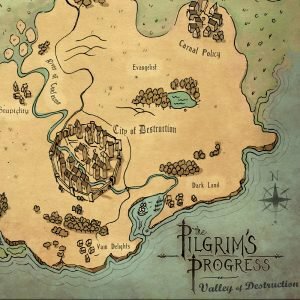 How did you come to have an interest in The Pilgrim’s Progress? What did you make these maps? During grad school, I needed to choose a story to develop for a class called Visual Development for Animation. I knew of The Pilgrim’s Progress, mainly from an illustrated version I had as a child, so I decided to read the full story and spend my semester designing characters and environments for The Pilgrim’s Progress. It proved to be a good choice. After posting some of that work online, I continued to get emails from Christians around the world expressing their love for The Pilgrim’s Progress and asking questions about my work. A few of these inquiries were from people wanting to work together to develop the story into either an animated film or video game. One such collaboration led to the need for an accurate map of Christian’s journey. Such a map, amazingly, had not yet been created. Though the original project was not able to get off the ground, I was able to finish the maps and make them available online. Over the years they have been useful and encouraging to many people. It is amazing to see how God has used what began as a simple school project, and how He guided the whole process of these 4 maps being drawn. I’m very excited for them to now be available on Visual Theology. Do you have more similar art to come? What else are you working on? I’m always taking on side work, and open to what God has next for me. I have actually been thinking about doing more well-designed printable assets based on The Pilgrim’s Progress, maybe stand-alone illustrations of various memorable scenes from Christian’s journey. What advice would you have for other Christians interested in working in a similar field as you? Read 723 times	| Like this? Tweet it to your followers!